(Francisco Kjolseth | The Salt Lake Tribune) Suzanne Hall, a nurse from Cedar Hills quickly finds out how much gauze is required to pack a wound as she attends the 'Stop the Bleed' class at Utah Valley Hospital in Provo on Tuesday, June 5, 2018. Hall hopes to join the campaign and start teaching the class as well, where people learn the basic actions to stop life threatening bleeding following everyday emergencies, mass shootings or natural disasters. (Francisco Kjolseth | The Salt Lake Tribune) Jake Dewey, left, and Tim Tsai learn the proper way to apply a tourniquet as they attend the free class 'Stop the Bleed' at Utah Valley Hospital in Provo on Tuesday, June 5, 2018. The campaign was started as a way to empower more people into action to stop life threatening bleeding following everyday emergencies, mass shootings or natural disasters. (Francisco Kjolseth | The Salt Lake Tribune) Sara Tanner applies direct pressure in a simulation during the 'Stop the Bleed' campaign which drew people to Utah Valley Hospital in Provo on Tuesday, June 5, 2018, for a free class to learn the basic actions to stop life threatening bleeding following everyday emergencies, mass shootings or natural disasters. 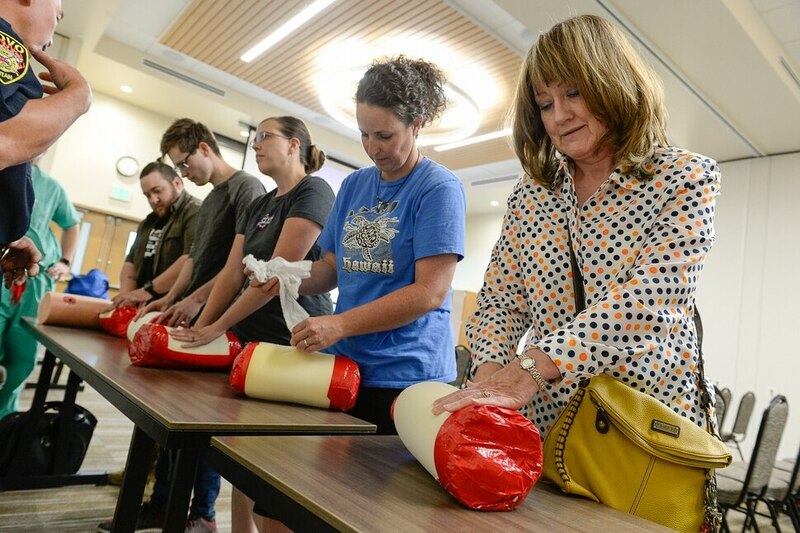 (Francisco Kjolseth | The Salt Lake Tribune) Registered nurse Tina Dewey teaches a free class called 'Stop the Bleed' at Utah Valley Hospital in Provo on Tuesday, June 5, 2018. Dewey teaches the class the first Tuesday of the month as a way to help people learn basic actions to stop life threatening bleeding following everyday emergencies, mass shootings or natural disasters. (Francisco Kjolseth | The Salt Lake Tribune) Dave Yei, a Provo firefighter and paramedic relays experiences in combat and how a tampon and tourniquet can be extremely useful when working with gun shot wounds as during a 'Stop the Bleed' class at Utah Valley Hospital in Provo on Tuesday, June 5, 2018. 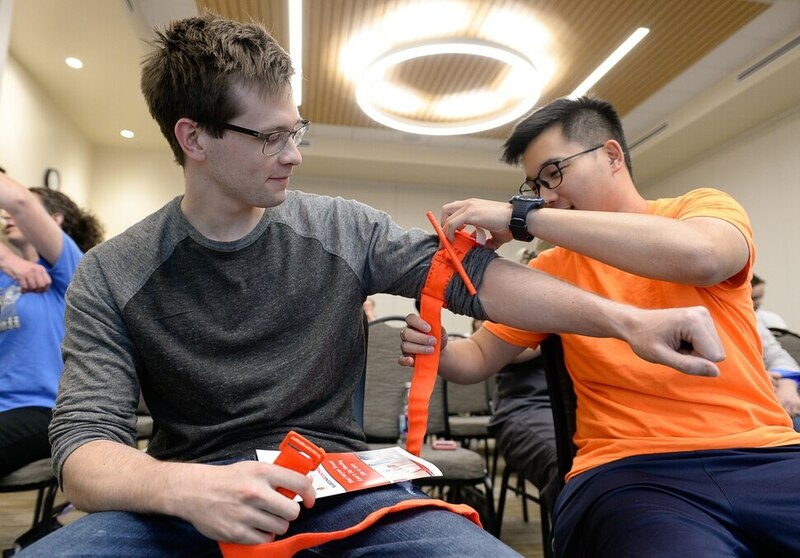 The free class is part of a campaign to teach the basic actions to stop life threatening bleeding following everyday emergencies, mass shootings or natural disasters. The question, posed by Utah Valley Hospital nurse Tina Dewey, is an unusual way to kick off a first-aid class. But the threat of gun violence is what’s motivating scores of Utahns to sign up for “Stop the Bleed” classes being offered by health care providers around the state. The Wimbers’ summer schedule is packed with festivals and fairs, and increasingly, Wimber said, he finds himself envisioning how a shooting or bombing might play out. Wimber, of Provo, has no background in health care; he is an IT specialist at Utah Valley University. But, he says, if he’s at a big gathering and the worst happens, he’d like to be of use. At Utah Valley Hospital in Provo, which specifically advertised its classes as preparation for mass shootings, enrollment spikes after high-profile shootings are in the news, said trauma surgeon Mark Stevens. A gunman opened fire on the Route 91 Harvest music festival on the Las Vegas Strip in October, killing 58 people and injuring 851. Recently, requests have come in from youth organizations, like Boy Scout troops and schools, he said. Teachers at Beacon Heights elementary school were trained last month following months of national debate and escalating fears after the February shooting at Stoneman Douglas High School in Parkland, Fla. The principal “wanted us to specifically come and talk to her teachers because of what’s going on in the schools,” Robinson said. The Stop the Bleed campaign grew out of studies following the Sandy Hook Elementary School shooting in Connecticut, where 20 students ages 6 and 7 were killed, as well as six adult staff members. Doctors at Hartford Hospital examined the role of blood loss in the deaths and began to campaign for more immediate, aggressive efforts to staunch bleeding in events with mass casualties. In Dewey’s class, participants learn to compress and pack wounds and use tourniquets. But they also prepare mentally to take steps that may sound obvious but could be easy to neglect in a crisis — especially a violent crisis. First, Dewey said, get safe and call 911 — and be ready to leave victims behind if the scene becomes unsafe. Next, find the source of the bleeding, Dewey says. That likely will mean removing a victim’s clothes and searching for wounds. Jeans, for example, can soak up a lot of blood and make a person with a cut femoral artery look like they are bleeding less than they actually are. “Make sure you get those off,” she said. When helping at a scene with multiple victims, people providing assistance will need to make decisions about what treatment is best — and keep in mind who may need medical help first. Gunshot wounds through the abdomen, for example, may not bleed much externally, which likely means the patient is suffering from internal bleeding. Also make note of victims who are confused, unconscious or whose bleeding isn’t stopping even with aid, Dewey said; those patients will be priorities for medical care. Once wounds are identified, they need pressure. Dewey and other teachers warned participants in a recent class of some unpleasant realities when treating a victim. Tourniquets are painful and frightening, and victims likely will fight whoever is applying it. Lock your elbows when compressing a wound; otherwise your arms will get tired while you wait for medics. Deep, large, gaping wounds may need to have cloth pushed into them, not just held on top of the cut — and if clean cloth isn’t available, use whatever is. No matter how resistant a victim is, Dewey added, be kind. Stop the Bleed classes have been going on in Utah for about a year, Robinson said. While they have recently been promoted in response to mass shootings, the skills apply to any traumatic injury that causes bleeding. Dixie Regional Medical Center in St. George, for example, advertised its class in connection with backcountry injuries common during summer’s outdoor recreation tourism. For class information, visit https://www.bleedingcontrol.org/.